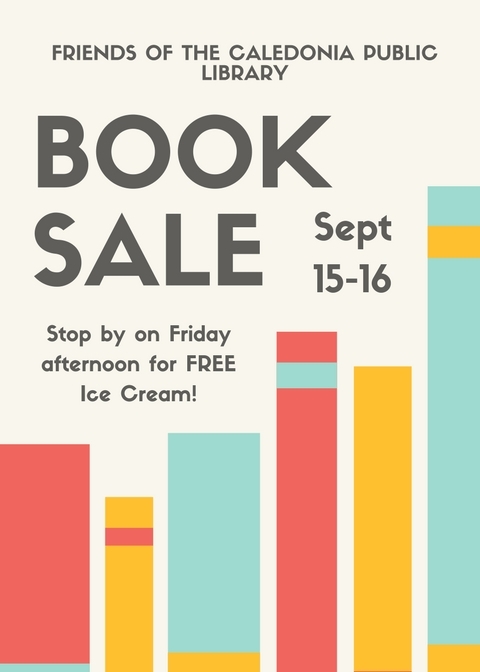 The Caledonia Public Library Summer Reading Program engages youth ages 0-18 in reading and learning activities during the months when kids and students aren’t in school. 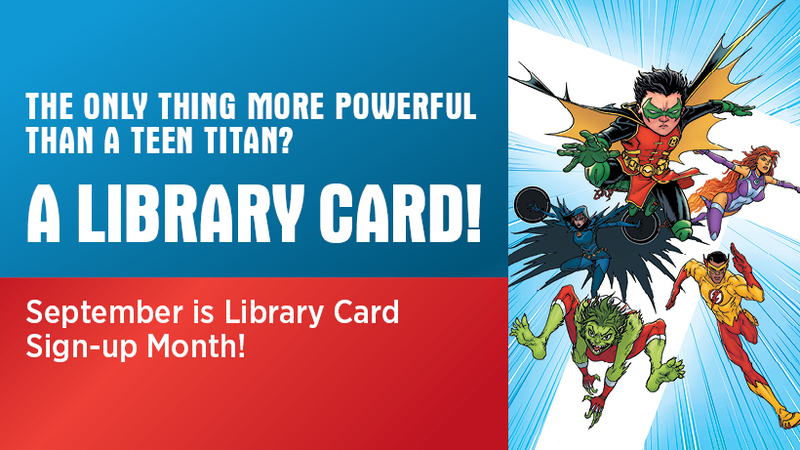 We do this by encouraging young patrons to set reading goals for themselves, which they have the entire summer to complete, and increasing the amount of programming available to this age group to attract them to the library. We are seeking one intern for the summer of 2019. The intern will be “unpaid” and will receive a $250 stipend at the end of their twelve-week term of service. The intern will be provided with training and materials to use during their term. In the case of early termination of the internship, the stipend will be prorated (the intern will receive only a portion of the stipend). 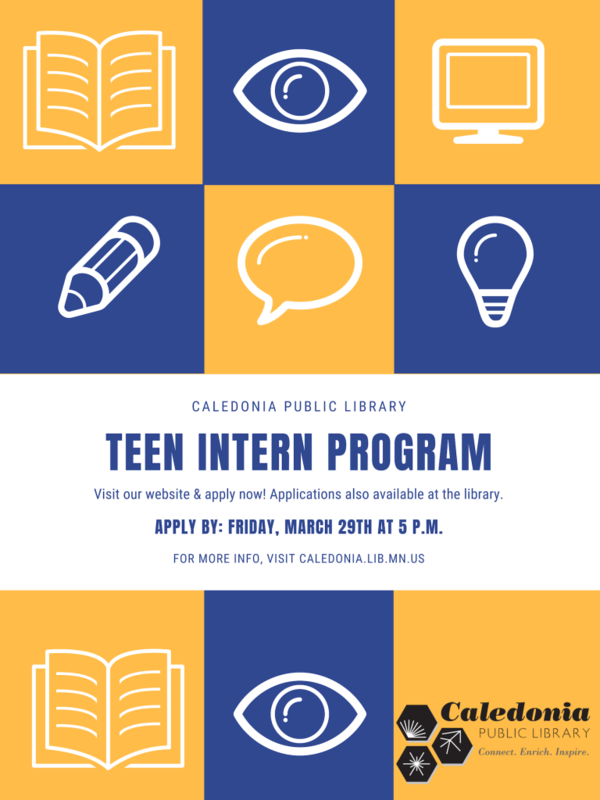 Applications are available to all teens, 14-18 years old in the Caledonia Area community. Once completed applications are received at the library, applicants will be notified about potential interviews for the 12-week position. Interviews will be held in early April, and training will begin shortly before school is out for the summer. Interns will be selected based on intention, work ethic, willingness to see projects through from beginning to end, leadership potential and enthusiasm for working with youth in a library setting. Interns will learn all of the parts to creating a successful library program–from thinking up new programs, to creating a budget, to promoting the program, to facilitating the program. The intern will meet with library staff before school ends in order to begin to brainstorm programs that they think may be successful at the library this summer. The intern will hopefully create at least one low-cost program for teens, school-aged youth or preschoolers that they will see through from beginning to end and help with other programs during the summer. There are so many possibilities for programs! Assist with everyday library tasks such as checking in/out materials, shelving, assisting patrons, etc. Sound fun? Fill out the application! Have a poem, song or short reading that you would like to share? 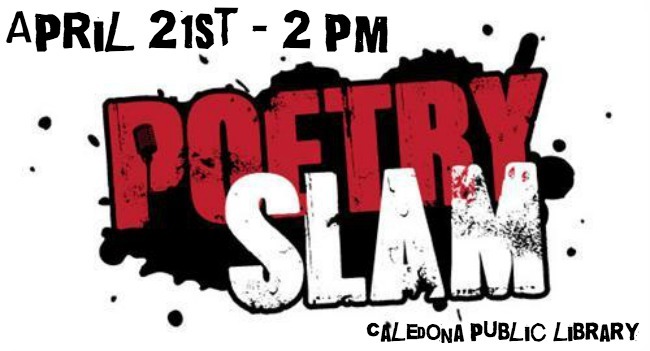 We’ll be hosting our first poetry slam Saturday, April 21st @ 2 pm. Spectators are welcome! Refreshments will be provided. Why should kids have all the fun? 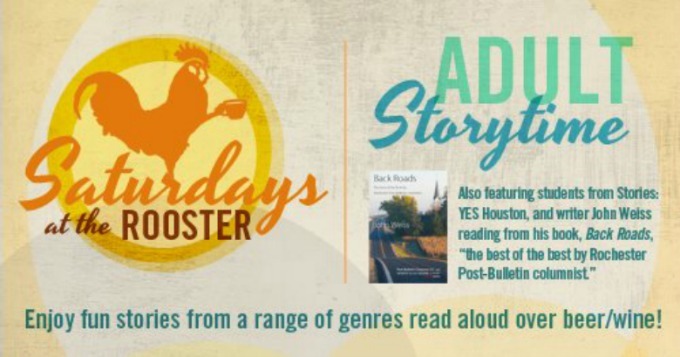 Listen as stories are read out loud while you enjoy a glass of beer or wine (or coffee or soda).